Description: For sale: One (1) new Sig Sauer MCX Patrol chambered in 5.56mm NATO. 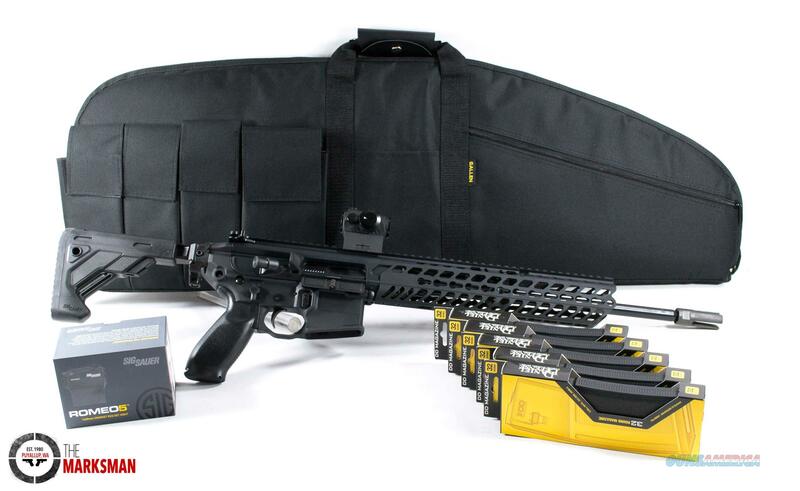 This rifle has a 16 inch barrel with a 1 in 7" twist, folding and telescoping(three positions) stock, aluminum Keymod handguard, an additional aluminum Keymod suppressor ready handguard(wider to fit a suppressor), gas piston system with an adjustable gas regulator, one 30 round magazine and comes with the factory cardboard box and factory paperwork. This rifle is coming with a new Sig Sauer ROMEO5 Red Dot Sight (SOR52001), an Allen soft case and five additional Daniel Defense 32 round magazines(making it a total of six magazines). The ROMEO5 red dot sight has battery power for 40,000+ hours of runtime; 10 Illumination settings(2 are for use with night vision scopes); a 2 MOA red dot and comes with a low profile picatinny mount and a 1.41” co-witness riser mount.